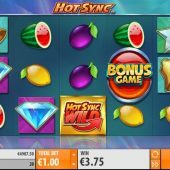 Hot Sync slot is in keeping with the typical Quickspin format, i.e. non-fussy graphics with the distinctive light orange buttons bar. The symbols consist of the again typical objects you'd associate with slots like 7's, diamonds, bells and gems along with fruits. You have 20 lines over 5 reels and symbols appear stacked up to 3 rows high aside from the Wilds. There are just a standard set of sound effects as you spin and this is easy on the player. 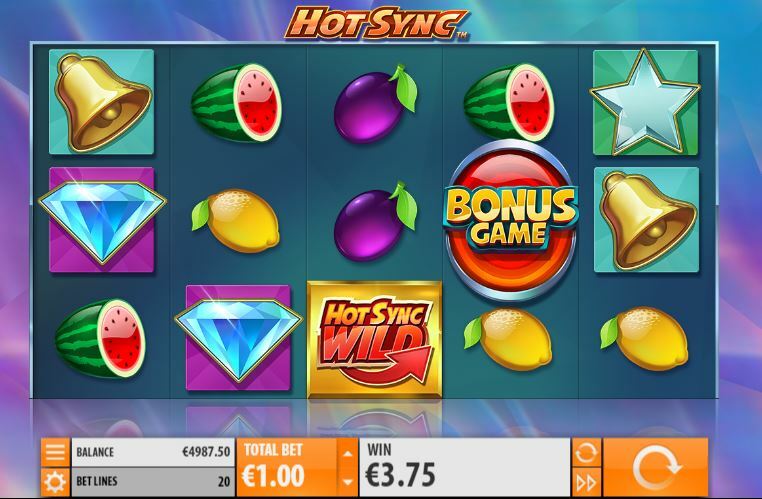 Hot Sync is quite a basic slot but there is one in-play feature involving Wilds. Your top paying symbols is the Wild which pays 50x stake for 5-of-a-kind then diamonds at 25x and the lowest fruit symbol pays 5x stake. You get single standard Wilds on all reels but there are also 'Hot Sync' Wilds on them all too. Should you land 2 or more the corresponding reels will respin and clone each other and there will be at least one Wild on them, sometimes 2 or even 3. The respin pays any wins and if a further Hot Sync wild lands the reels will respin again with the original ones plus any new one(s) all being synced (or cloned) as I call it. Theoretically this could produce a screen of Wilds eventually at 1000x stake. Three bonus scatters only appearing on the centre 3 reels triggers 8 free games. In these 2 or more Sync Wilds aren't necessary - for each that appears that reel turns 'hot' for the rest of the spins and also adds an extra spin. The Hot reels will have at least one Wild on them, so eventually you could land a Hot Sync Wild on all 5 reels if you were lucky and have them all spinning cloned for 1 or more spins depending on how quick you hit the Wilds. The slot is quite similar to Netent's Twin Spin in its mechanics, and naturally you can get full screens in the base game via the stacked symbols.